This tutorial provides you with a foundation for working with Adobe Dreamweaver HTML5 insertion. It is the third lesson in the Adobe Dreamweaver CC Digital Classroom book. For more Adobe Dreamweaver training options, visit AGI’s Dreamweaver Classes. Dreamweaver CC has a newly reorganized Insert panel and improvements to the Property Inspector allowing you to work intuitively with the new HTML5 elements. Examples of HTML5 elements you can now insert include the semantic elements; <header>, <nav>, <section>, <aside>, and <footer> and all of the new HTML5 Form elements. In previous versions of Dreamweaver, there was no visual support for these elements. Users could add them in code view using Dreamweaver’s code hinting interface, but they could not add them with the Insert panel or set their properties using the Property Inspector. 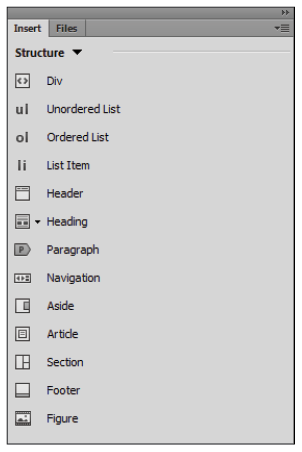 You can easily add HTML5 elements in Dreamweaver with the revised Insert Panel. You can also use the Insert panel to add HTML5 Form elements in Dreamweaver. Dreamweaver CC’s HTML5 improvements don’t stop with semantic elements and forms. Add HTML5 Audio and Video to your site for plugin-free multimedia in today’s modern browsers and mobile devices. The new Insert panel and Property Inspector improvements extend to HTML5 Audio and Video allowing you to insert multimedia into your site without plugins, extending your audience to a wider variety of devices. 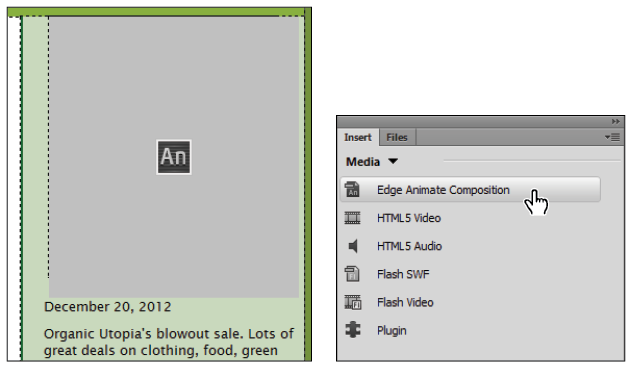 Add plugin-free audio and video with the HTML5 elements in Dreamweaver. You can also style HTML5 Audio and Video elements using CSS to create unique user interfaces and playback controls that would be nearly impossible with plugin-based multimedia. Use a CSS3 transform to tilt the HTML5 Video element and play your video at an angle of 25 degrees or round the corners of the video to mimic a vintage picture tube television set. 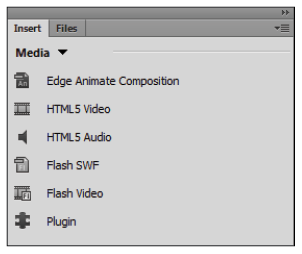 Add standards-based compositions directly from Adobe Edge Animate. You can create interactive animations, animated web banners, and more with Adobe Edge Animate, part of the Adobe Edge suite available with a free Adobe Creative Cloud subscription. See http://creative.adobe.com for more information. Dreamweaver CC also added improved FTP performance using a robust multi-threaded FTP engine making the transfer of large projects easier and more efficient. Live Search on Mac OS makes it faster to find files with real-time search results that update as you type. HD video and images are increasingly in demand on today’s high-end mobile devices. Dreamweaver CC is compatible with HiDPI to support today’s devices with HD capability such as Apple’s Retina display. See available Dreamweaver Training Classes and learn from the expert instructors at American Graphics Institute. In-person classes at our locations, online courses, or private training is available. These tutorials are created by Jennifer Smith and the team of expert instructors at American Graphics Institute. See our Dreamweaver Training Classes and learn from the expert instructors at American Graphics Institute in small classes or through private training.